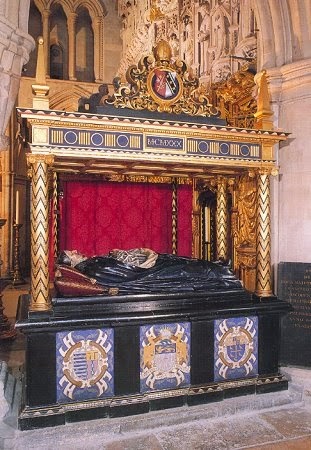 The tomb of Lancelot Andrewes in Southwark Cathedral. the famous collection of prayers he composed. Today Bishop Lancelot Andrewes is commemorated in the Church of England. He was born in 1555 in Barking, and studied at Merchant Taylors’ School and then Pembroke Hall, Cambridge. After ordination, he held several posts before accepting, in 1601, the appointment of Dean of Westminster, where he gave much attentlon to the school. Andrewes was present at the Hampton Court Conference in 1604, which sought to bring peace between different schools of thought in the Church of England. He was also a translator of much of the Old Testament of what is known as the ‘Authorised Version’ (or ‘King James Version’) of the Bible. His preaching and his writings proved highly influential and his holiness of life and gentle nature endeared him to all who met him. Andrewes was appointed bishop, first of Chichester, then of Ely, and finally, in 1619, of Winchester. He died on 25th September, 1626 and his remains lie in a church which was then in his diocese of Winchester but now is the cathedral for the Diocese of Southwark. with acceptance and admittance to thy blessed table. Whence is it that the Mother of my Lord should come to me? who hath so often affended, despited and neglected him? and give himself to him for spiritual food. But will God dwell indeed on the earth? how much less this house, that I have builded? in this my poor and wretched soul? what greater argument of his love is there, can there be showed to me? then consider and well weigh, what benefits it bringeth with it. that the Deity may live and abide with us. What therefore, O my Lord, shall I do? What thanks shall I render to thee? With what fervency shall I love thee? how should it be, but that I should return love again to thee? and following those things which thou dost command? and avoid those things, which are to thee unpleasing. as that nothing under the sun may separate me from the love of thee.